Berlin, Germany offers an efficient, cheap and reliable public transportation system, where any local or expat can live easily without a car. The transit system is operated under the BVG (Berliner Verkehrsbetriebe) and the DB (Deutsche Bahn). These companies are integrated for users. The U-Bahn and S-Bahn are the most commonly used transportation systems in the German capital. The transit tickets in Berlin work on the honor system. Officials go undercover in regular clothes, and will come out of nowhere to inspect the passengers on the bus, rail, metro, small ferries and tram. If you travel by train, the tickets are easy to purchase and then validate before boarding. Ticket machines usually are in German and English, and are easy to figure out. Children between the age of 6-14, and large dogs, get discounted prices. Children under 6 and small dogs ride free! 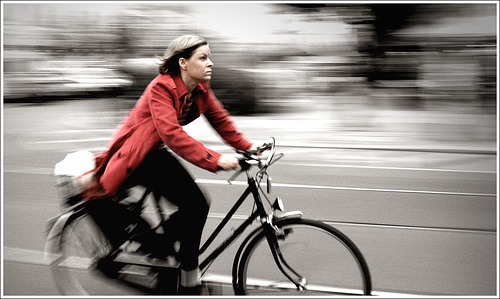 In addition to public transit options, Berlin is also a great city to be a cyclist. The city planners are determined to make Berlin a cyclist city, and there are currently 620 kilometers of usable bike roads. You are allowed to carry your bike onto the U-Bahn, S-Bahn and trams. During the Cold War, the U-Bahn and S-Bahn trains were severed between East and West Berlin. After the Berlin Wall came down in 1989, the broken links were reunified. Click here for links to maps of the BVG public transit system. The BVG bus system has 147 lines during the day, and 46 during the night. There are over 2,500 stations that extend into every borough of the city. To get off at the bus stops, make sure you pay attention to the overhead announcements. They will say the name of your upcoming stop well in advance, and you must push a button to make the stop. 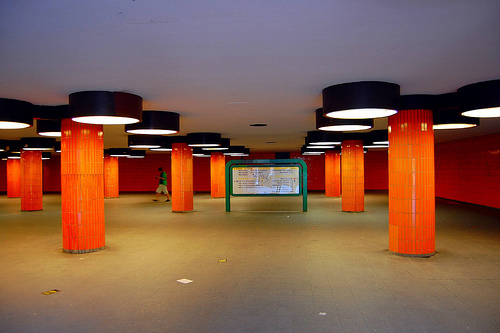 Berlin has an extensive U-Bahn metro system, with 10 lines that run through 173 stations. The tracks make up 147 kilometers, and about 80% of the tracks run underground. During peak hours, the trains run approximately every 2-5 minutes, and then every 5 minutes for non-peak hours. During evenings and Sundays, this train runs every 10 minutes. The U-Bahn offers 24 hour service on weekends. It is a widely used train system with 1.4 million people riding it daily. 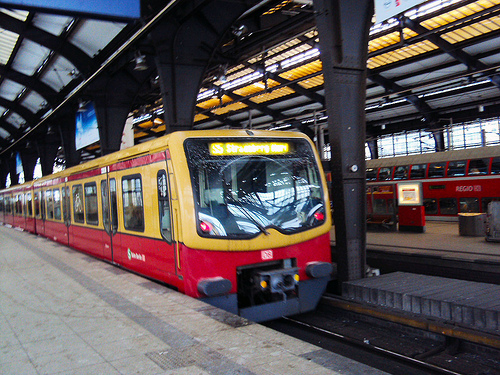 The S-Bahn is a mostly overground system, that has some suburban stops. There are 166 stations through 15 lines. The main elevated line runs east to west on the Stadtbahn, which goes through the city center. There is also the S-Bahn Ring, called the Ringbahn, which goes in a circle around the city center. 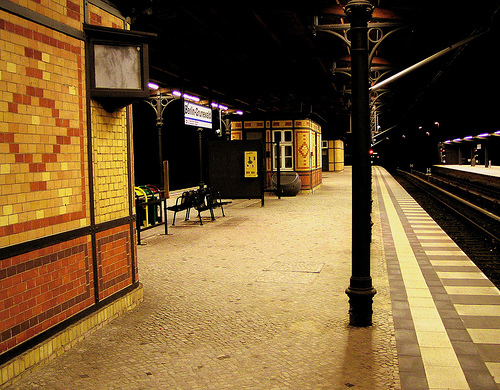 Its “ring” resembles the head of a dog, so Berliners refer to the Ringbahn as “Hundekopf” (dog head). There is also a third important line which runs north to south, the Nord-Sud-Tunnel. Though it is run by the DB, riders can use the same valid transit tickets as the BVG.